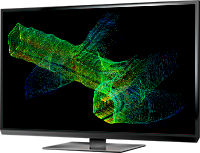 Brisbane, QLD, Australia – Deswik announces today the inclusion of new mobile 3D scanning tools in its upcoming software release, version 2016.2. With the International Congress for Mine Surveying (ISM 2016) taking place next month (Brisbane, Sept. 13-16), Deswik will use this event as a platform to officially launch and showcase this exciting new functionality to the mine surveying industry. 3D mobile scanning has been gaining popularity in recent years as a rapid and effective solution for a variety of underground survey applications. Deswik has partnered with Peck Tech Consulting Ltd., the industry leader in this field, whose offerings include the uGPS Rapid Mapper™ solution. This product was purpose-designed and built for the underground environment and can generate 3D point clouds from virtually any moving platform- a mine vehicle, LHD (Load, Haul, Dump machine), All-Terrain Vehicle or even a remotely-operated robotic vehicle. Integration has been a key driver of Deswik’s software development since its inception. The software platform currently integrates with most mining packages and a myriad of file formats. With Deswik’s focus on empowering its users to achieve productivity improvements, the 3D scanning integration is a welcome addition as the company continues to expand its integration capability across the mine planning value chain. Please visit the Deswik booth at ISM 2016 to learn more about this exciting partnership and how to seamlessly integrate mobile 3D scanning into your existing Deswik workflows.